In Peripheral Trajectory you stand with your upper body in a horizontal cylinder while 3D images are projected on its surface. 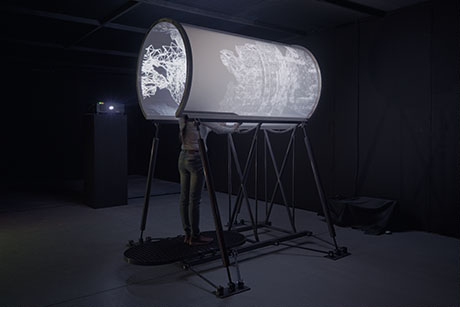 The work completely absorbs you and gives you an intense full-body experience of pure motion by projecting images in your peripheral field of vision. Images that present you with the feeling you're moving, or that the world is moving towards you. Straight ahead, in the central field of vision, all is dark. Outside this gaze of darkness, at the edges of the visual field, a 3D reconstruction of a city is visible; an almost abstract urban environment that has no visible reference to any specific location. Through subtle manipulations of movement, perspective distortion and slight shifts in balance, a disruptive physical experience is created. The interface is designed around the cylindrical shaped screen that has a length of about 200 cm and a diameter of about 120 cm. By stepping backward and forward on the tilting floor grate the direction and speed of the virtual camera can be controlled. While the camera moves through the geometry of the buildings these are deformed with an effect that's inspired by the vertigo effect or dolly zoom; an unsettling camera effect applied in cinema that appears to undermine the normal visual perception and is often used to represent a 'falling-away-from-oneself feeling' or a 'feeling of unreality'. 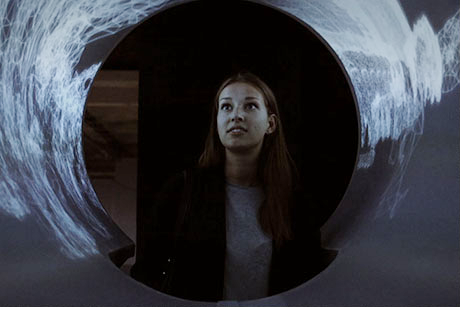 Peripheral Trajectory investigates our peripheral vision as it is mainly this part of human sight that is responsible for detecting motion and most importantly, for the conceptual understanding of the things around us.